The route follows the Montgomery canal - an almost totally rural waterway - before joining the Llangollen canal and crossing the spectacular Chirk and Pontcysyllte. Our route starts in the market town of Welshpool with its historic sandstone Powis Castle, attractive High Street and a narrow gauge steam railway, and follows the Montgomeryshire canal following the Severn valley. The canal is currently undergoing restoration with parts of it navigable, parts in water but not yet navigable and a section that remains dry. The towpath is continuous throughout, and the quiet nature of the canal means that there is wildlife in abundance. The route joins the Llangollen canal and the tranquil border countryside gives way to the spectacle of the Chirk aqueduct and tunnel. The canal clings to the valley of the River Dee as it runs into the beautiful Welsh hills and crosses 120 feet above and 1000 feet across the Dee on the spectacular Pontcysyllte aqueduct. Beyond the aqueducts Llangollen is fine town beautifully located on the Dee. It has plenty of independent shops, a steam railway, historic houses and scenic walks, and is the home of the annual Eisteddfod. 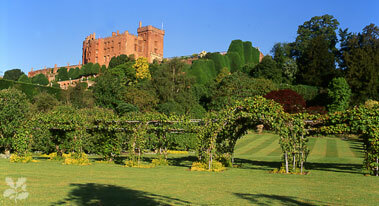 Welshpool - A fine Welsh town with the spectacular sandstone Powis castle as its main attraction. The town also has its own steam railway and an interesting shops on the main streets and the narrow lanes running off it. If this is your start point why not take some more time to explore the beautiful border countryside. The railway also provides links to the Welsh coast or the mediaeval town of Shrewsbury. Chirk - An additional rest day provides the opportunity to visit the 13th Century Chirk castle, or visit the mediaeval towns of Chester or Shrewsbury both just 30 minutes by train from Chirk railway station. Llangollen is a pretty tourist town with lots of independent shops and plenty to see and do. You can visit the ruins of Dinas Bran Castle or Valle Crucis Abbey, the beautiful and historic gardens at Plas Newydd, travel on the steam railway, go to the motor museum or explore the river and Horseshoe Falls where the river feeds water to the canal.